While I am pleased the palmar P3 angle increased by 1 degree, it still does not fall within the ideal range of 3-8 degrees. I will use the shoe and glue to build the added heel height I need. 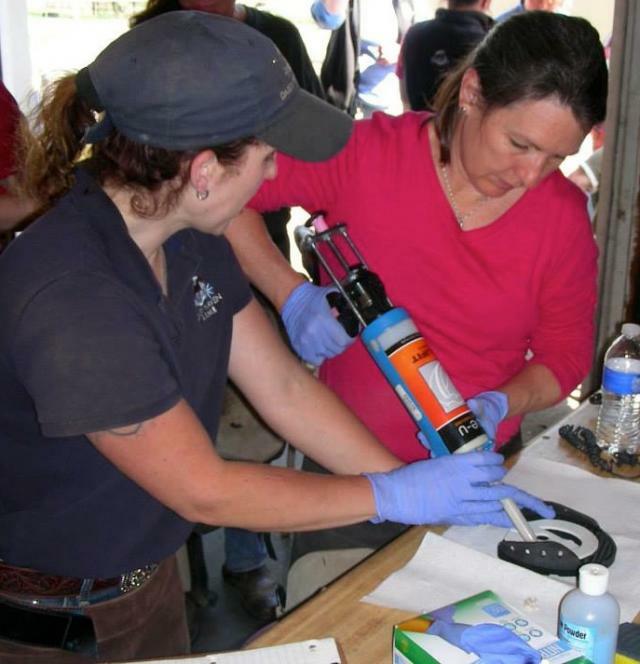 Trim and prep the foot the same way you would for any EasyShoe application with the following additional steps: http://www.easycareinc.com/education/videos.aspx. When wedging the heels I use dental impression material and EasyShoe Bond glue to create the wedge. The added benefit of using EasyShoe Bond instead of Adhere is that I can treat the foot with specific antimicrobials and the glue will still stick. In our wet climate, I always use fungidye in my quarters, old nail holes, etc. Be sure to use your moisture meter and butane torch to thoroughly dry the area you're treating before glue application. 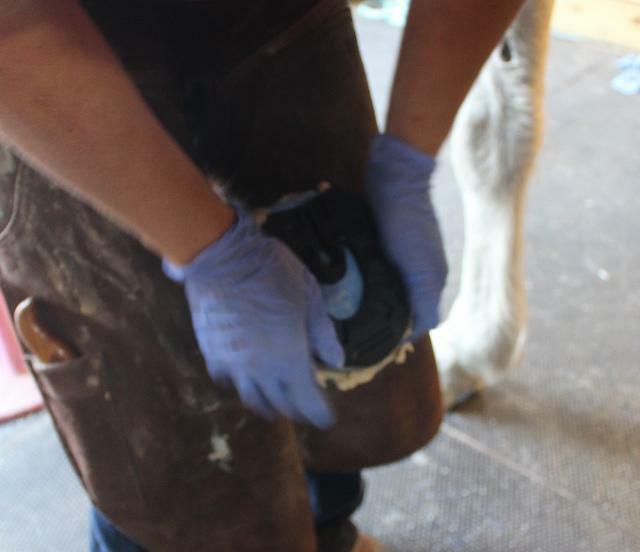 I also like to use an antimicrobial hoof packing like Artimud by Redhorse Products around the frog under my dental impression material to prevent thrush and foot funk from growing under the shoe and packing. Once your foot is thoroughly prepped, the shoe and wedge can be applied. As soon as you start these next steps you are on the clock as the dental impression material (DIM) and the glue both cure pretty quickly, usually within 2 minutes or less. I'd definitely recommend recruiting an assistant or two to help ensure successful application if possible, especially when first working with these materials this way. Mix the DIM material 50/50. 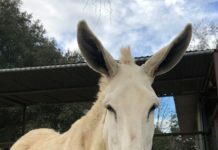 Most brands bought in farrier supply stores will work well. How much you need depends on the size foot, amount of concavity/frog present, and amount of wedge you need to build. In this case, I have a foot with a full frog, a little bit of concavity, and aiming to build a 3 degree wedge. Blend the two colors together until they are one uniform color and STOP MIXING. The heat from your hands will speed up the curing process. Place the DIM near the horse's foot you're working on; I like to use the top of my tool caddy. Apply the glue to the shoe, adding extra glue in the back of the wings and the heel area of the shoe as this will create a good bond with a wedge effect. When using DIM, I remove the white liner on the shoe as the DIM is providing the glue dam instead. Walk over to the foot quickly, placing the shoe within reach, and pack the foot with the DIM. Do not pack where the glue is going to bond. Be careful to add height of the DIM at the back of the foot as this creates your wedge. 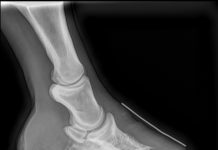 Note: the horse had an infected area of wall which I cleaned up prior to gluing creating a dip in the medial heel quarter in the photo. Apply the shoe when the glue is just starting to get thicker, as thin cold glue will not hold the heel height. As you are applying the shoe, press DOWN in the toe. This is going to finish the wedge effect. The timing of the glue in this step is the hardest part of this process with the biggest learning curve, but well worth it to be able to build with the glue. The amount of wedge you create is dependent on the height you build with your DIM, and the amount of glue between the shoe and the foot at the toe. So pressing down on the toe is a critical part of the wedge. Plus it gives you extra glue to spread and feather on the rest of your shoe, especially the heels and wings. When you're finished smoothing the glue hold the foot up until the glue is cured. If you put the foot down, you will compress your wedge and probably wreck your glue bond in the process. Hold the foot up until the glue is hard to the touch, even if it's still tacky and warm, usually only 2 minutes. 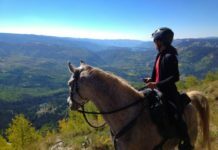 Be prepared to have a competent horse handler at the horse's head with some distraction available if necessary to encourage the horse to stand. 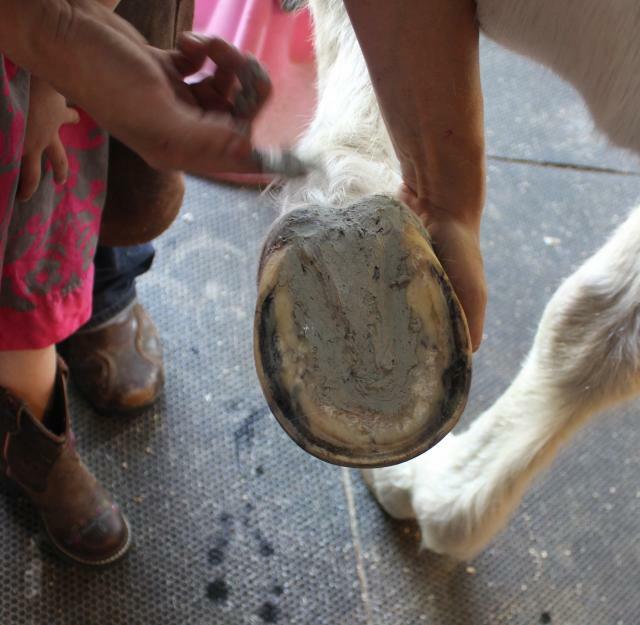 If the horse is footsore on the other foot, please apply an Easyboot with a soft pad to the supporting foot to help the horse stand comfortably. The finished product. The palmar P3 angle increased to 4.35 degrees, so I'm very happy, and so is the horse.